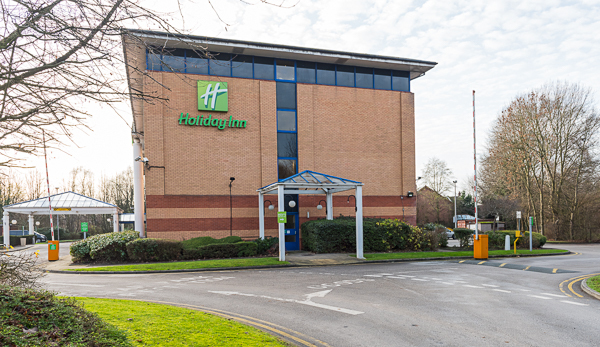 From the roundabout on the A57 between Warrington and Manchester, take the B5210 (Woolston Grange Avenue) and less than 200 metres after leaving the roundabout, the entrance to the Holiday Inn is on your immediate left. If the barrier for the right turn is UP (as per the picture above), turn to the right and park in any of the parking spaces on the right or directly opposite and behind the hotel. Then please walk around the building and go in the Front Entrance. We will be straight through Reception (remembering to register your car registration on either of the two screens on the Reception Desk) and go straight through towards the back of the Restaurant and after going down some steps, we should be in a room on the right. If not sure, ask at Reception where the Warrington Advanced Motorists are meeting.